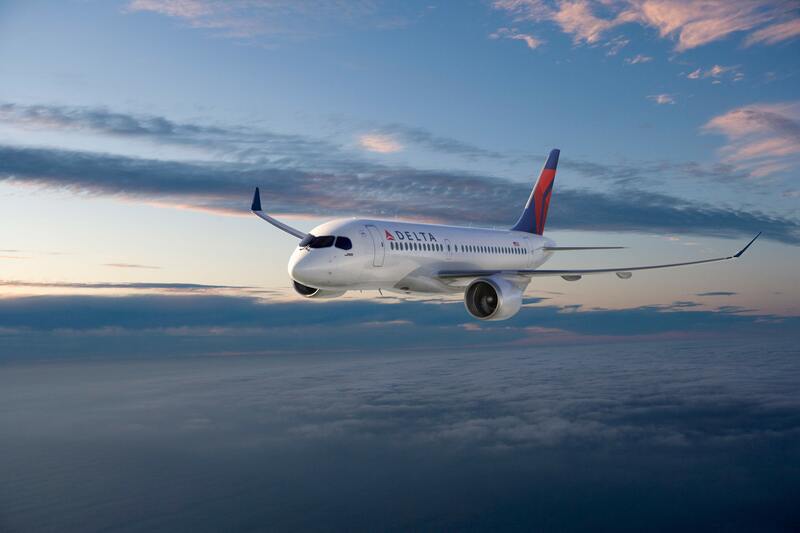 Delta Air Lines will continue its narrowbody fleet renewal with the state-of-the-art Bombardier C Series, providing for added network flexibility with more fuel-efficient mainline aircraft. This transaction is part of Delta’s domestic strategy to upgauge the fleet, allowing the company to achieve its long-term financial targets, including 15 percent EPS growth and generation of $4 billion to $5 billion in free cash flow annually, while replacing less efficient domestic aircraft. With the order of the C Series, Delta will no longer induct the E190 into its fleet as planned. 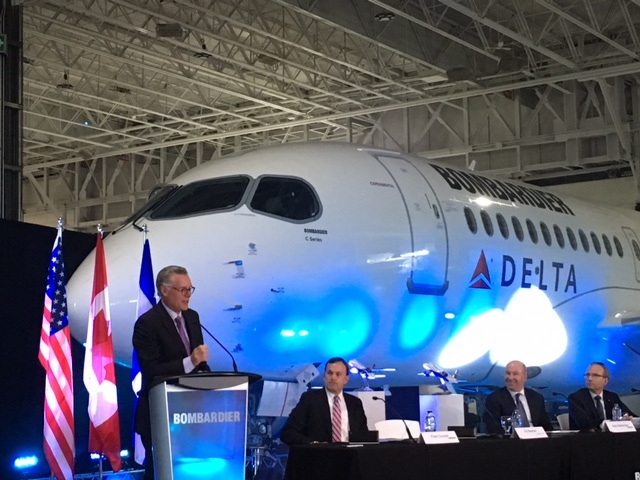 "We are very proud to welcome Delta as a C Series customer and to expand our partnership with such a prestigious airline,” said Alain Bellemare, President and Chief Executive Officer, Bombardier Inc. “Given Delta’s position as one of the world’s largest and most respected airlines, this deal is a strong endorsement of the C Series as the best performing aircraft in the 100-150 passenger class. The addition of Delta to our marquee C Series customer list gives us tremendous momentum as we approach entry-into-service this summer." Statements in this press release that are not historical facts, including statements regarding our estimates, expectations, beliefs, intentions, projections or strategies for the future, may be "forward-looking statements" as defined in the Private Securities Litigation Reform Act of 1995. All forward-looking statements involve a number of risks and uncertainties that could cause actual results to differ materially from the estimates, expectations, beliefs, intentions, projections and strategies reflected in or suggested by the forward-looking statements. These risks and uncertainties include, but are not limited to, the cost of aircraft fuel; the impact of rebalancing our hedge portfolio, recording mark-to-market adjustments or posting collateral in connection with our fuel hedge contracts; the availability of aircraft fuel; the effects of terrorist attacks or geopolitical conflict; the possible effects of accidents involving our aircraft; the restrictions that financial covenants in our financing agreements will have on our financial and business operations; labor issues; interruptions or disruptions in service at one of our hub or gateway airports; disruptions or security breaches of our information technology infrastructure; our dependence on technology in our operations; the effects of weather, natural disasters and seasonality on our business; the effects of an extended disruption in services provided by third party regional carriers; failure or inability of insurance to cover a significant liability at Monroe’s Trainer refinery; the impact of environmental regulation on the Trainer refinery, including costs related to renewable fuel standard regulations; our ability to retain management and key employees; competitive conditions in the airline industry; the effects of extensive government regulation on our business; the sensitivity of the airline industry to prolonged periods of stagnant or weak economic conditions; and the effects of the rapid spread of contagious illnesses. Additional information concerning risks and uncertainties that could cause differences between actual results and forward-looking statements is contained in our Securities and Exchange Commission filings, including our Annual Report on Form 10-K for the fiscal year ended Dec. 31, 2015. Caution should be taken not to place undue reliance on our forward-looking statements, which represent our views only as of April 28, 2016, and which we have no current intention to update.